In ancient Egypt, there were many different types of emblems or insignias, of various types. Scepters make up one small group of these. Egyptologists believe that symbolic scepters were derived from professional tools. Men used them more than women did, and kings more than officials and deities. The most typical male insignia was what is commonly referred to as the sekhem-scepter, or often more technically referred to as a shm-scepter. There seems to have been some slight variations in this type of scepter, or at least the hieroglyphic sign related to it, which also implied slightly different meanings, but no real distinction can be drawn between their various uses. According to the various publications of the British Museum published in connection with the Tutankhamun Exhibit, they included the sekhem-scepter (symbolizing "the powerful"), the aba-scepter (symbolizing "the commander") and the kherep-scepter (symbolizing "the controller"). These same translations are also provided by Richard H. Wilkinson in his book, Reading Egyptian Art. These various scepters could be used in hieroglyphs to represent similar meanings. Interestingly, Geoffrey Graham in the Oxford Encyclopedia of Ancient Egypt defines them somewhat differently, referring to the shm- or sekhem-scepter as symbolizing control and the hrp- or kherep-scepter as govern. As a hieroglyph, it expressed "power" and any deity's stellar manifestation. The word sekhem could also refer to divine beings, and even the stars, as powers. Being a symbol of power or might, the sekhem was frequently incorporated into various names, such as the king's name, Sekhemkhet, and Sekhmet, the lioness-goddess who's name means 'she who is powerful". These scepters resembled a flat paddle on a papyrus-umble handle. It looked to a certain extent, like a modern fly-swatter. It's symbolic role may have originated in Abydos as a fetish of Osiris. Osiris was often called "the Great Sekhem" or "Foremost of Powers". Hence, the sekhem was often used as a symbol of the underworld deity. This probably led to the scepter also becoming an emblem of Anubis. The sekhem-scepter was sacred to Anubis in the temple of Hu (known as the "Enclosure of the Sekhem" (hwt-shm). Anibus is frequently depicted in his manifestation of a reclining dog with the sekhem-scepter behind him. In such depictions, the scepter is often portrayed with an elongated head. The scepter was also associated with Khentimentiu (Chief of the Westerners), another deity who was especially associated with the royal cemetery. In this type of iconographic representation, the sekhem is often given two eyes, which were carved or painted on the scepter's upper part as a symbol indicating that it was the manifestation of divine power. This symbol of power was sometimes shown in the hands of kings from the Early Dynastic Period onward. After the 3rd Dynasty, the sekhem appeared in the royal names of the pharaohs, and later in the titles of queens and princesses as well. When the king held a sekhem-scepter in his right hand, we would usually hold a mace or censer in the left. However, from the earliest times, viziers and other officials of important rank held the sekhem, signifying the individuals successful life and prestigious position. Such officials were often portrayed holding the scepter in the course of performing their duties. If they held the scepter in their right hand, they would usually hold a staff in the left hand. The classic Egyptian funerary statue depicted the deceased with a staff in one hand, and the sekhem in the other. As a scepter of office, a pair of eyes were carved on the upper part of the staff. The sekhem-scepter was also used by supervisors of ship building. The sekhem was also utilized in temple and mortuary offering rituals. The officiant who presented the offerings often held it. In such cases the scepter was held in the right hand and was waved four or five times over the offerings while ritual recitations were being made. 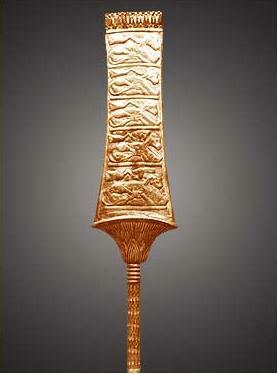 A gilded sekhem scepter was found in Tutankhamun's tomb. On the back of this scepter were carved five registers depicting a slaughtered bull, which may indicate that the scepter was waved five times over the offering. We are also told that, when consecrating offerings, the king used two sekhem-scepters; one for Seth, and another for Horus. Elsewhere, Horus and Seth appear as "the Two Sekhems" (shmwy). Sometimes this type of scepter hieroglyph could have represented the sistrum, a musical rattle that was sacred to Hathor and was carried by her priestesses. The sistrum had a metal loop with jingles mounted on a cow goddess faced handle.